Pictured above is the Omori Church. 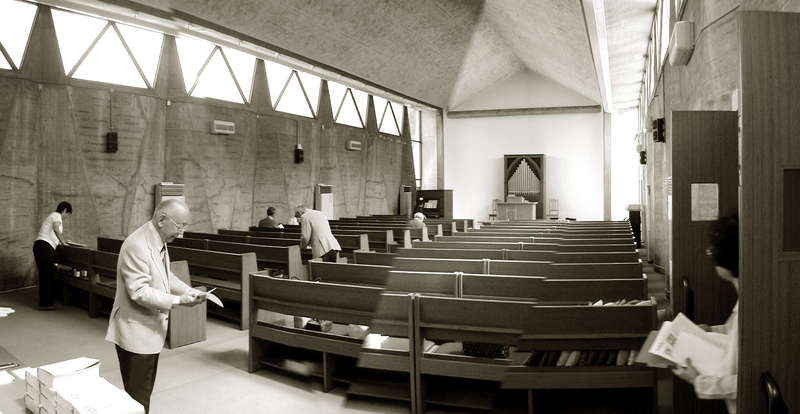 Built in 1959, the church was designed by a Japanese architect, a friend of a friend of mine. The church is in Yokohama, Japan. Notice the large space – created by exclusion of poles that we normally see holding the beams and the ceilings in the centre. Instead, concrete walls holds everything in place. The construction started in April, 1959 and was completed in October, 1959. The church needed to replace an old wooden chapel, built in 1922. My friend Kah Wah, an artist who is based in Singapore often reads and participates on the Tribalmystic blog. On Cool Stuff, I posted pictures of some beautifully crafted churches and this story sparked an interest in Kah Wah to share the beautiful Omoru church with us. Unfortunately, we were unable to find the name of the architect who had been in contact with Kah Wah some years ago. “The church was part of the projects designed at the R.I.A. Institute of Architecture (translation from Japanese to English). The chapel has been constructed specifically without poles to obtain the space. If anyone reads this story and knows the architect – please share the information here. Thank you Kah Wah of this beautiful picture and story. Click on Kah Wah’s name to see some of his beautiful artwork. I love the simplicity of the building and I think I’d feel very calm being inside it. A safe place. Yes Claudia – I feel the same way. Thank you. oh wow…..the supermoon has an effect…..”compliments to the chef”….thanks friend for the extra efforts…..